I think there is inherently something problematic about writing minimalist music written for smaller, or at least, less diverse ensembles. Since the music has to conform to a fairly strict compositional style, variation has to come in the form of harmony and instrumental texture, to a greater extent than 'normal' music which will play with melody and, crucially, variable rhythms to keep the listener engrossed. Unfortunately, The Hours is almost entirely performed by strings and piano, a nice and simple combination that can be most effective, but in this case makes the stand alone listening experience considerably less interesting than many of Glass' more extravagantly orchestrated scores. One thing I cannot deny the score to The Hours is atmosphere, there is a beautifully well sustained melancholy through almost the entire score, but by about halfway through there is the feeling that nothing new is likely to occur before the end. Glass' recent Naqoyqatsi developed different ideas through imaginative orchestration, changing tempos and surprising harmonic twists. Of course, a film like The Hours needs a degree of subtlety that, I appreciate, doesn't afford the composer the chance to be all that daring. For the first two thirds of the score, harmonic shifts are largely incremental, there are certainly no pleasingly adventurous changes of key. While the dramatic impact seems appropriate and, to be fair, most fetching, it does become somewhat wearing. There are few obvious stand out tracks, but the final few beginning with Tearing Herself Away, are able to pull the listener from a somnambulant state. There are some good minor/major modulations and escalating tension, while Escape! throws in a couple of very rapid, very typical Glass arpeggios, which are an effective way of highlighting certain dramatic moments. Both demonstrate what the rest of the score lacks in its generally unvarying levels of drama. The Hours makes for a potent final track and certainly leaves the impression of a second half that is of much greater interest than the first, although by that moment, some might feel it's too late. While the film had very different subject matter, Michael Nyman's score to The End of the Affair had similar problems as an album to The Hours. You cannot fault either for their sense of mood and gently moving drama, but eventually, the repeating patterns make the listener feel as though they're being beaten about the head, rather than gently moved, so it starts to drag and become tedious. Die hard Glass fans might find more to enjoy, but I suspect the more casual listener will find it hard going if not boring, even if the final cues are almost worth the wait. Reading the liner notes from the director and some passages from some of Virginia Woolf's novels might pass the time otherwise. A score that really does seem like hours. 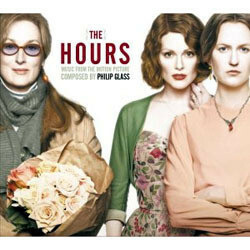 The Hours - based on a novel by Michael Cunningham and with actors like Nicole Kidman (a performance which won her an Academy Award), Meryl Streep, Julian Moore and Ed Harris - was one of the most popular films last year, both among critics and movie goers. I didn't really like it. Mostly because I felt it was too slow and far too depressive, but also because of Philip Glass' Academy Award nominated score. Although the three interwoven stories themselves are told in a slow pace, Glass' everpresent music was far too nervous, and therefore also made me nervous and restless. So for me, the score and the visuals didn't match at all, the score being too obtrusive and "busy". But that's the music in the film. On CD Glass' score works quite well. And the strange thing is that on CD, the score doesn't seem obtrusive and nervous at all, but rather soothing. Instead Glass' repeated rythms and musical figures and motifs, often performed by string quartet and piano, create a very pulsating, vibrant and relaxing sound. The opening track, "The Poet Acts", presents a pulsating ostinato, performed by slow strings, forming a backdrop for some wonderful writing for cello. Absolutely beautiful in its simplicity and one of the best tracks on the disc. "Morning Passages", the films main title music, introduces the listener to a lovely piano solo, backed up by soft strings. Throughout the entire score the music never rests. There's always some string figure in the background, or an ever moving piano. The absence of a strong main theme is nothing that affects the score in a negative way. On the contrary. The entire score is based on repeated figures and rythms and the sudden appearance of a strong, hummable theme would probably destroy much of the sound that Glass achieves. There's something special about Philip Glass' music. The way his music almost hypnotizes the listener with its pulsating rythms. Now, whether you think this is a good thing or not, is enterily up to you, of course. I think it's interesting and mesmerizing.